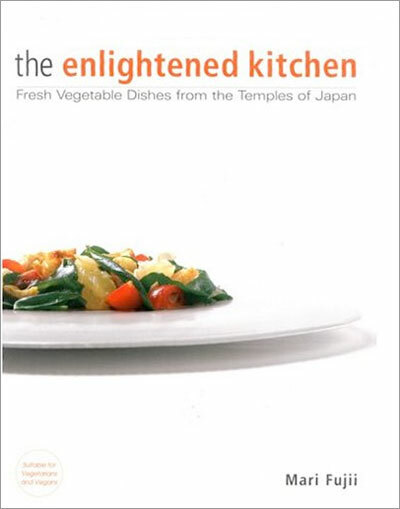 The Enlightened Kitchen: Fresh Vegetable Dishes from the Temples of Japan by Mari Fujii is a beautifully presented, easy introduction to the world of shojin ryori (or shoujin ryouri 精進料理), the highly refined vegan cuisine developed by Buddhist monks in Japan. I've often been asked by readers of this site and other people to recommend a good shojin ryori book: While there are many such books in Japanese, I haven't really been comfortable recommending a book in English so far. Shojin ryori tends to use a lot of ingredients that are only available in Japan - even more so than 'regular' Japanese cooking - and it is a haute cuisine that requires a lot of skill. The Enlightened Kitchen, on the other hand, is filled with nonintimidating recipes, that any amateur cook with decent access to Japanese ingredients could tackle. Some of the vegetables and dried ingredients may trip you up, but it's easy to think up suitable substitions. The author, Mari Fujii, is married to a Buddhist monk, and has been teaching, speaking and writing about shojin ryori and other types of Buddhist vegetarian cuisines for 2 decades in Japan. The book is divided into six sections: Soup; Salads; Tofu and Beans; Vegetables; Potato, Rice and Grains; and Desserts. There's a small but essential Basic Techniques section, and a useful glossary. Most of the recipes are vegan, following shojin ryori teachings, but a few do use dairy products, which are used in Chinese Buddhist temple food for example. It's a really beautiful book, with gorgeous photos and layout. It's a pleasure to hold and just flip through. And now the part you've been waiting for (or skipped forward to): The Giveaway! I have one copy of The Enlightened Kitchen to give away, courtesy of the publisher, Kodansha International. Just leave a comment to this article, making sure that you put a valid email in the email box (don't worry, no one but I will see it). To make it a bit more fun, tell us what your favorite vegan dish is, linking to the recipe if possible. Your comment must be posted before 23:59:59 CET (Central European Time) on Sunday, June 7th. One winner will be selected at random, and announced sometime next week. Good luck! The giveaway is now closed. The winner will be announced later this week! Submitted by maki on 2009-06-01 18:20.
mmmm, non-intimidating recipes, this sounds key! :) I wish i lived closer to an asian-foods store...the only place to get good Japanese ingredients is an hour away. It's well worth the trip, though! The health benefits themselves are a payoff! I cannot begin to describe how delicious this dish is! Argh - forgot to mention fave vegan dish. We don't get to eat many vegan dishes (thus my curiosity in the book). On occasion I can get by with stir fry with tofu or fried tofu. That sounds wounderful! I would love a japanese vegan cookbook! Its pretty hard to find vegan cookbooks that dont have the same recipes as everyone else or lists of insane ingrediants that I can almost never find. My favorite vegan dish would probably be either koyadofu (cooked in kelp dashi) or hiyayakko (with chopped zassai on top). And I would love this book! I'm not a vegan, by any means, but a book with some interesting, tasty and not too madly fussy vegan recipes sounds excellent. Perhaps there might even be a recipe that will inspire my children to eat tofu. They'll eat pretty much anything else, but the younger one in particular can smell the stuff a mile off! New to your site and am enjoying both sites. These "Barbecued Seitan Ribz" recipe is wonderful and is good for bento. Am vegetarian but starting to cook more vegan. This one looks great! I love tofu in all forms so this book is extra exciting! I would absolutely LOVE to have this book :) And red beans and brown rice is up there on the vegan list, though I don't follow a vegan lifestyle. I'd have to say my favorite vegan dish varies according to season. In the late fall and winter, I like to make a dish of mushrooms braised in red wine with thyme, and a warm lentil salad. In the early spring, when it can still get a little chilly, I often make a simple ragu of spring vegetables like peas, asparagus, radishes, and green garlic. Once summer takes hold, it barely takes any effort at all - beautiful tomatoes and basil with a simple vinaigrette and some toasted walnuts, or chilled soba with dipping sauce are probably the most common. I'm a vegetarian who comes very close to veganism, so I would love this book. As far as my fav recipe goes, I love this recipe for sausage-style tempeh crumbles. So much flavor while still being fairly virtuous. I use it in pasta, on toast with wilted spinach or for biscuits and gravy. Yum! Favorite would be curried lentils. Enjoy your site! This recipe is a new one for me, I only made it on the weekend, but it is awesome! Sounds interesting! I've been trying to incorporate more meatless dishes into my diet, this book would be an excellent source from the sounds of it. I love this dish as it contains some of my favorite foods. Note: PCC Markets is a wonderful shopping and eating experience. I luckily have one right in my area. They have many yummy healthy foods. Organic, vegan, you name it. Sounds wonderful! My first introduction to Shoin Ryori was by Soei Yoneda's Heart of Zen Cooking. My favourite recipe - simple and flavourful Shungiku no Norimaki - Chrysanthemum Leaf Nori roll, delicious! I would love to have a copy of the book - I love vegetables and the simple and clean style of the recipies sounds very appealing to me. My favorite vegetable recipie is a simple green bean dish that my mother makes with crunchy sliced beans with a seasoning of mustard seeds, nuts, ginger and fresh grated coconut that my mother makes. Sounds intriguing, and the library doesn't have it - count me in! Although I'm an omnivore, I cook mostly vegan dinners at home. One of my favorite vegan dishes is bread. Yep, bread. Just plain water, salt, yeast (or starter), and flour. It's so good right out of the oven, all warm and flavorful. One way I like it is just with a little white bean dip, good tomatoes, and slices of ripe avocado. I'm excited to check this book out. I am not a vegetarian, but I loved the shojin-ryori meals I've had in Japan. The creativity was stunning. I would love to win this. I like to eat vegan dishes, but I don't have a favorite recipe of my own. Mmmm. Personally, I love legumes, all of them (Even natto). I'm a big fan of an impromtu beans tossed in herbs and quickly cooked - a great example of this is from another favourite food blogger, Stonesoup. Temple food IS enlightenment.. when you do a temple stay program at a Japanese or Korean temple (I did this one.. http://eng.templestay.com/), stiff from sleeping on the floor, sore but relaxed from a few hours of meditation, enjoying the smell of pine and magnolia, but somehow inexplicably ravenous despite sitting on a cushion all day... really the food is as close to heaven as I have ever been. I am never disappointed by Robin Robertson's Vegan Planet and Quick Fix Vegetarian. I modified her Split Pea Soup recipe and ended up with a really satisfying result. I own that book. It's great! I bought it at the kinkakuji!! Since I don't read Japanese either: at what temperature and for how long do you bake them? I already have one terrific Shojin Ryori book, Zen Vegetarian Cooking by Soei Yoneda. I would love to have a different perspective on this cuisine. Depending on the season, I have different favorite vegan recipes. In cold weather I love Myra Kornfeld's Onion Sonata, a luxurious, slow soup made with six different kinds of onions, from her book the Voluptuous Vegan. During summer I frequently make fresh Vietnamese-style spring rolls from Vegetarian Times magazine. You wrap rice vermicelli noodles, sauteed tofu, avocado, pickled ginger, cilantro, mint, and parsley in rice paper. I like them even without dipping sauce! My favorite dish is a stir fry of egpplant and tofu in a sesame ginger sauce. I don't think in terms of vegetarian/vegan/carnivore/omnivore so I don't have specific recipes. Fried rice though is a favorite, whether asian or hispanic version. Also, rice, black beans, lettuce, guacamole, tortilla, and salsa combined into a lovely salad is one of my favorites. My favourite vegan recipe is an almond cream from The Schumacher College cookbook Gaia's Kitchen (see http://www.schumachercollege.org.uk/news/previously-sold-out-new-_gaias-... ). When I was completely vegan, this recipe seemed miraculously rich: it uses the protein in blended, blanched almonds to emulsify a fine stream of oil, following same principle as mayonnaise. With plenty of honey, it is quite transformative for vegan deserts. It's not quite healthy, but in an all-vegan meal there is room for treats. It's so hard to pick just one dish, but vegetable sushi is one of my all-time favorites, especially since there are so many different variations you can make. This book sounds wonderful, thanks for the giveaway and review! with grilled eggplant (or any other grilled vegetable) is my current favorite vegetarian recipe. Not actually vegan, but I do heart me my vegetables. And I can't limit it to just one dish that I love. Wow, this sounds really interesting. I'd love to win this book! My favorite vegan meal is stir fry with tempeh. I make a nice sauce and include pineapple in it too. It is so good! I learned this dish while working at a restaurant. My favorite vegan dish would probably be claypot mushrooms and tofu. The best version of the dish I've ever had was in a little restaurant in Vietnam. It was so yummy I am still trying to recreate it. I love vegan and vegetarian food, so it's hard to say which is my favorite vegan dish, but let's say it is spring rolls with ripe mango, rice noodles, crispy cucumber, matchstick carrots and crumbled "sa shi su se sho" tofu. cookbook! cookbook! Thanks in advance for the lovely giveaway!! This cookie recipe is hands down the best cookie recipe I've ever found. You won't believe they're vegan, and healthy! Clotilde's recipe @ChocolateAndZucchini for raw cashew cheese is my favorite vegan recipe. IT's this awesome stuff that I use in all types of sweet and savory dishes. I turn it into dips. Use it for ricotta in lasagna. Sweeten it with maple syrup and serve with fruit. Pipe it into the deep fryer for felafel-like goodness. Use it with a béchamel in vegan gratins. Very versatile. Maki - thanks for your outstanding work on Just Hungry and Just Bento. I've been lurking mostly on Just Bento (thanks to being pointed towards it a couple of times by my sister) and skip over to Just Hungry from time to time. Your lastest reviewed book looks great. I'd love to be in the competition. It's simple and delicious and easy to adjust the amount of herbs/spices to make it as spicy or as mild as you like. Thanks for posting about this book. When I was in Japan, I really wanted to try a shōjin ryōri meal, but it was out of my budget. I've heard that preparing food in this style is like a meditative art form, so I'd really love to learn. My favourite vegan dish would probably be an assortment of any cooked vegetables, steamed or dressed up. This book would make a fabulous addition to my already large collection of Japanese cookbooks! Thanks for the review, Maki! The books great and I'd love to have it on my shelf. I find it tough to nominate my favorite vegan recipe because there are so many but one dish wins out thanks to its all round versatility - miso soup! It appears on my dinner table in some form or another at least once a week, more so in winter. Great book review! Sounds like it's chalk-full of great recipes. My favourite recipe so far has been the carrot kinpira over on justbento.com! I plan my meals around what's available...bless everyone for such brilliant ideas! i came across this recipe for a spicy green bean and tofu salad at Eric Gower's Breakaway blog a while back. ginger, green garlic, and habanero ftw! so good. or when i'm lazy, homemade miso soup is perfect comfort food. My favorite vegan dish is yellow rice with beans. The ingredients include onions, garlic, cilantro, cilantro, saffron, tomato sauce, pigeon peas, and rice. It's so good; I'm honestly not sure why I don't make it more often. My second favorite dish is much simpler; it's just fried tofu and green string beans over white rice. The best vegan dish I've had was from a cafe a few states south; an organic panini with apple slices, lettuce, tomato, avocado, and their home-made dressing. It was awesome, and I haven't been able to remake it yet. I love anything tofu except the stinky kind. My favorite vegan dishes are vegetable stir-fries with tofu and my own "macaroni and not-cheese" which has the same comfort-food feel as mac and cheese but with a different flavor and without the dairy. And Chinese scallion pancakes for snacks. Yum! 8 oz. pasta, cooked: elbow macaroni, penne, ziti, rotini, and similar shapes all do well. 2 Tbsp unswetened soy milk or other non-dairy "milk"
If using fresh garlic, saute briefly to flavor the oil. Keep or toss the sauteed bits as you prefer. In the case of granulated garlic, add with everything else. Toss pasta with oil, non-dairy milk, and nutritional yeast until well-blended. If it tastes a bit like mustard, add more garlic to balance the flavor of the yeast. Just found your site today and what luck — wonderful recipes AND a contest! I recently arrived in Japan and have been feeling overwhelmed by the supermarket and cooking in general. as (after many years of learning French and German) I never thought I would end up here. "nonintimidating recipes, that any amateur cook with decent access to Japanese ingredients could tackle"... sounds just about right! finally! a promising shoujin ryouri book in English :D my Japanese isn't good enough to read Kano Yumiko's books, so I would love to get my hands on this. Thank you Maki for posting about this book, and for your awesome website! 'Lo, Always enjoy your articles Maki! Believe it or not, my favorite vegan dish is plain ole' fruit salad. Yep, that's right -- just cut up fruit! I can hardly wait to get my hands on this book one way or another! I am struggling to think of a recipe of the top of my head... I'm big on vegan cupcakes, though! I have a recipe for awesome green tea cupcakes on my blog, but one would need to change the frosting around to make it vegan because it has dairy. I would suggest making a vegan buttercream with something like passionfruit, raspberry or pomegranate flavor. I also love the spinach chickpea curry from Vegan with a Vengeance by Isa Chandra Moskowitz. Not sure if the recipe is online, considering copyright etc. Ooooh. That cookbook sounds lovely. Fave vegan dish, huh? I don't know that I have one right away, as every vegetarian dish I've tried still seems to have cheese on it. The closest I think I've come is a local Thai restaurant makes a cashew tofu dish that's really tasty. That's most likely vegan, unless there's something hiding in the sauce. I go vegetarian for lunch so this book wiill come in handy! My favorite vegan dish is a little boring I'm afraid! It's lentils! I'm not sure why but when I'm over-tired or had a stressful day I love eating a warm bowl of lentils. I've prepared them many ways over time, but I almost always put cumin in them to make them taste "meatier." One of my favorite vegan recipes that I make at least once a week is goma-ae. I use this basic recipe. It's so simple and so satisfying! My favorite vegan recipe so far is a simple zucchini crumble. With "herbes de provence" (i live in Southern France) and a little grated parmesan cheese on top. I need nothing more. I'm not a vegan, but I do have friends who don't eat meat so I find myself looking into a lot of vegan and vegetarian recipes. I will also find that exploring these recipes are a great way to eat healthier. my favorite vegan recipe has been on my mind lately as the weather warms up. i love making tabouli. things that make my tabouli different are that i make it with quinoa (my husband can't eat cous cous due to a gluten allergy) and i add a little bit of minced raw garlic. i also mince up some preserved lemon and add some of the goo from the jar (i make my own, but you can buy it as well- the preserved lemon, not just the goo!). i love the extra lemony kick that it adds. My favorite Japanese vegan dish is tofu dengaku. I've only made it once, but it's a fun treat, and I may have the chance to make it again soon over a wood fire. My fav vegan dish is the knishes from Vegan with a Vengance. I love shojin ryori! I have a book I bought in Japan about 10 years ago that is quite intimidating, so this sounds like it'd be right up my alley. It hopped into my Amazon cart, but maybe I'll wait and see if I get lucky? I don't cook vegan food often, but I do have many vegan friends (or other special diets like gluten-free or vegetarian). I think vegan food is something great to do for lunches or dinner, one meal a day or for those that have a dairy intolerance (myself included). I am also specifically interested in this book since it has a spiritual aspect behind it, being linked to Buddhism. In my experience, often times the best food is found at temples around the world! I don't have a recipe I can link to that is vegan, but I do have a recipe from my own private stash on how to make home-made seitan (which is great because it's not readily available in most areas). Place gluten lour, nutritional yeast flakes, garlic and onion granules in a medium mixing bowl and stir them together. Measure out the liquid ingredients and place them in a small mixing bowl. Stir them together and pour this liquid into the dry ingredients. Mix well. If there is still flour around the edges, add a small amount of water (1 to 2 Tbsp only!). You should now have a large, firm, spongy mass in the bowl. This is called gluten. Knead the gluten directly in the mixing bowl for a minute just to blend. Do not add any more flour. Then slice the gluten into three relatively equal pieces and set aside. Place the ingredients for simmering broth in a 4 ½ quart saucepan or Dutch over, add the gluten pieces and bring to gentle boil. Reduce the heat to medium-low and simmer the gluten partially covered for one hour. Maintain the heat so that the liquid barely simmers, and turn the gluten over several times during cooking. Remove the saucepan from the heat and let the seitan cool in the broth uncovered. Transfer the seitan to storage containers and add enough broth to keel it covered. Cover tightly with lid. Can store in refrigerator for up to ten days or freeze up to six months. To extend the life of seitan indefinitely, boil it in its broth for ten minutes two times a week. The cookbook sounds delicious! After living in Japan for a few years, I've been missing Japanese food ever since, especially the amazing variety of tofu available there! Warm the sesame oil in a pan or wok, throw in the chopped up bok choi. Stir until tender, add tofu. Crush (or cut up) the garlic and add. Sounds like a good book, I'm going to recommend it to my friend ... unless I get a free copy, in which case I'll just give it to her. My favorite vegan (and raw) dish is from a restaurant: Leaf in L.A., where they make collard green wraps with tons of veggies and bean & nut-based croquettes. This book sounds really interesting! I'm also looking forward to all the vegan recipes people will post or link to in the comments here. The amounts of honey/sirup and mustard can be adjusted to taste. Personally, I use more than the recipe here requires. Just taste the marinade until you like it! Drain Tofu and cut into 1/2 inch cubes, then put in a casserole dish. Mix the ingredients for the marinade and pour marinade over the tofu. Let the tofu marinade like this for at least 20 min or up to a day (1 day will yield the best result). Put the casserole in the fridge if you let it marinade for more than a few hours. Preheat oven to 200°C/392 F and bake for about 20 minutes until golden brown. Serve with rice and vegetables! Hey Everyone! If you live in NYC or plan to visit, there's a new Shojin restaurant that opened called "Kajitsu." Check it out on yelp.com or visit www.kajitsunyc.com. It's gotten great reviews. Thanks for featuring this book! If I don't win, I'll certainly need to buy a copy. My husband is Japanese and has introduced me to many, many wonderful foods. Nothing makes me happier than simple yudofu with ginger and green onions. Any veggie dish in Chinese cuisine, especially tofu and eggplant! ooo this would be great for my dad! Love it! The book looks great, and the idea to include recipe links in the comments was brilliant! I need all the good vegan recipes I can get. Rich, creamy, savoury and no creepy vegan 'cheese' involved. I love all kinds of greens! This light cooking method is quick garlicky and has loads of flavor (especially if you add a little fresh nutmeg!). I would love to have this book. Thoughtfully prepared meals are the best to feed our soul. I also would love to enter, I was lucky enough to sample shojinryori when I lived in Japan. A far cry from what the normal food I learned to cook there, but fun nonetheless. As for great vegan recipes, what a good idea! I can't tell you a favorite, since I love them all, but since we're cold down here sub-equator, I am making Japanese curry and rice- for tonight's dinner- boil up carrots, potatoes, onions, maybe some TVP and shiitake, boil til almost tender, drain. Make a roux of oil and flour, cook over low heat til browned, add about 1t curry powder and 1T sugar, then add back the drained water to make your sauce. Whisk til it's smooth, a few lumps are OK. Add the cooked veggies back to the sauce, add extra salt to taste, slice up a tomato and throw in (my host-mother's secret curry ingredient), cook another 10 min or so, if the sauce is not thick enough for you add 1T arrowroot in 2T water and mix in. Check salt and sugar and voila! Eat with rice and benishoga. Vegan curry is simple. Also- Mari- love your blogs. I don't have my favorite vegan recipe online. It is a toasted quinoa salad with carrots and cashews. I don't have too difficult of a time finding Japanese ingredients, thanks to living in Greater Seattle. I'll look to see if the public library has this book available. If not, I'll make a request for them to order it. That book sounds wonderful. I remember when the temple chef appeared on Iron Chef. Everything looked so light and fresh that he made. With some steamed veggies or a salad on the side, you've got a complete meal! In a week I'll be leaving to spend the summer with my vegan girlfriend, while I have only been edging toward vegetarianism-- so I'll definitely be looking to learn some new foodways : ) Thanks for the opportunity! Though I always thought I disliked coconut, hot sticky rice with coconut milk and cold mango has won me over. The contrast in temperature and texture is stunning. I would love to win your copy of The Enlightened Kitchen! And my favorite vegan recipe is Lemon-Scented Quinoa Salad from 101 Cookbooks. I have made it many times for vegan and non-vegans alike and everyone just loves it. I don't purposefully eat vegan but this book might be a change agent to get me to try more vegan meals. My favorite vegan recipe is a Black bean and Corn salad with a Southwestern vinagrette. Although I don't have the vinagrette recipe handy -- I usually make it up as I go along -- this dressing incorporates the major items: cilantro, cumin, and cayenne. Would love, love, love to have a copy! I have no favorite vegan dish as there're so many delicious ones, to choose one over others would be unfair--although miso soup with silken tofu and vegetables of the season seems to be the one I eat most often. I love food infused with Japanese accents, & always turn to this page for inspiration for simple , delish, quick-to-prepare dishes. I don't really have a favorite vegan recipe. I have spent a bit of time in Japan working for an NTT company, and am trying to learn some good healthy recipes. I enjoy the recipes on your site and have had good success with all that I have tried. My favorite vegan food would have to be tabbouleh -- specifically my mom's version. I'm afraid I can't link to any recipe in particular since whenever it gets made at my house, we really just throw in whatever fresh vegetables we have on hand. Always present are chickpeas, cucumbers, red peppers, and parsley. Looks like a great book! I'd love to get it in my kitchen! My favorite vegan recipe is one I've worked out myself, trying to copy a dish at Laughing Seed Cafe in Asheville, NC. (http://www.laughingseed.com/index.php?page=1) The Harmony Bowl as they serve it is layered with brown rice, pintos, tofu, steamed veggies and a delicious dressing/sauce (the closest I've come to it is the Ginger Soy dressing in the Joy of cooking). You can also add the sea vegetable of the day is you like. It's warm, tasty and oh so filling! drat...for some reason my putting links in is triggering the spam filter. I have a recipe for mango (or other fruit) with stick rice that is a wonderful breakfast or dessert dish, and another for Dan Dan noodles. Mmmmm this books looks awesome! I love the simple vegan stuff, like rice and veggies w/ vegan kimchee. I've tried fancier things, but I always come back to simple basic things. My favorite vegan dish is zaru soba. It's so nice to eat something cold when it's hot outside. I am a vegetarian and my sister is vegan, so we both spend a lot of time cooking. One of our favorite recipes is vegan apple pancakes with chopped fresh fruit and homemade maple syrup on top. Delicious. Sounds intriguing! I have been trying to incorporate more vegan and vegetarian dishes into my life. I love tofu in all forms, especially the seasoned, dried squares of spiced tofu that I slice and stir-fry with green beans, garlic, and a splash of soy sauce. This books sounds great. I'm not vegan but would love to try and move in that direction a little more than I am. From reading the review on The Enlightened Kitchen, it appears that this is the perfect cook book for preparing vegetables with zen appeal. And the fact that an amateur cook can follow these recipes with ease is a definite bonus. I’m no professional in the kitchen, but I love experimenting with creative/healthy ways to prepare veggies for my family. Well, regardless of the contest, I'm really happy you reviewed this, because otherwise I would have assumed the recipes would be too difficult. We stayed on Koyasan for one night during our honeymoon and the food at the monastery where we stayed was some of the best anywhere during the whole trip (even though we ate kaiseki ryori for most of our dinners). I'd love to win it anyway, of course, but either way, thanks for reviewing it. It doesn't have a name so we just call it Cauliflower Nom (we are silly people). I'm no way near eating like a vegetarian. In summary i love to eat meat, veg... whatever taste good. But on many occasion i have craved a meat free meal. One of my favorite and easy go to soup is a "Mulit-Beans Minestrone" recipe by Lorna Sass, made with meat free stock. Wholesome and satifying... and I loved it how it so convenient made in a pressure cooker too! And when i'm in Paris, L'A Falafel in Marais... my favorite! MMMM... The eggplant soup sounds very good! Man, now I'm hungry. This blog often has that effect. this book sounds really good! i've always wanted a japanese cookbook with vegan foods and this one sounds like the recipes aren't too complicated or difficult, which is great for me since my family isn't vegan so i cook mostly for myself. I'll still try looking for this book too- i'm really curious. I don't have a favorite recipe, but my first cookbook Vegan Express by Nava Atlas has one of the first recipes i ever used: seitan gyros. that's basically saute garlic and onions then add seitan, oregano, and cumin until the seitan is golden. then place the seasoned seitan in pita bread with a cucumber and vegan ranch/creamy dill dressing with tomato slices and lettuce. Im not a vegetarian but I really do enjoy Vegetarian food. My favourite vegetarian recipe is an older type of recipe. I love this in winter time because its so filling and tasty. We actually use a vegetable based chicken flavoured stock in house as well. I often use swiss brown mushrooms in this instead of plain ones as well for the stronger flavour. This book was probably the first Japanese cookbook I cooked from, and has some of my absolute favourite recipes which I still use today. I'm glad to see it getting an airing here. A must! Whoever wins is in for a treat. Its nice to have lots of veggie recepies! specialy with the summer coming... looks great! No matter how many food blogs I read, I find myself returning to your's (both Just Hungry and Just Bento) when I'm looking for dinner inspiration. I was a die hard omnivore until the doctor told me my cholesterol was way too high for someone in their twenties, so I've been trying to eat vegetarian more often. Bring large pot of salted water to boil. Cook potatoes until tender (~12 minutes), rinse under cold water, dump on cutting board and cut into chunks. Boil peas for 1 minute, rinse under cold water in colander. Return water to boil, add pasta, cook until al dente, reserving 1/2 cup cooking water. I like to add mangoes to the fruit mix. Regarding my favorite recipe, I really don't have one, but I'm hoping that this book will spark an interest to actually start following some of these delicious recipes, instead of just reading about it and dreaming. Not really a dish per se, but i could eat plain chickpeas for every meal! Noddle soup with vegan dashi/ shoyu broth, shirataki noodles, tofu cubes, bamboo shoots, baby bok choi and shiitake. My favorite vegan recipe is actually Maki's tofu pudding. This book sounds really intriguing, as non-intimidating recipes are important to this klutzy cook! I NEED this book! I've wanted to taste this cuisine and have had problems finding decent recipes, just like you said. I am a vegan, so asking me to choose a favorite vegan meal is hard, but when I want to impress people and prove that vegan = edible, I make a curry or a soup. I have three roommates, one of whom is vegetarian. I like to cook large meals for the whole house in order to get feedback on the recipes, so I've started exploring the world of vegetarian cusine. Thus far, my absolute favorite recipe is one for Veggie Couscous from a one-dish meal cookbook. Combine cooked couscous with yellow squash, zucchini, chickpeas, red bell pepper, season with cumin/curry/garlic/pepper, and bake until warm in a 9"x13" baking dish. For the non-vegan version, drizzle with a few tablespoons melted butter. Simple, quick, and delicious! Unfortunately, I do not come bearing recipes. But I will say that few things beat asparagus roasted in a super-hot skillet, with sea salt baked into the surface. Or cannellini salad, with red onions, lemon, good olive oil, parsley & tomatoes. Falafel is easily my favorite vegan dish, hands down. I want for nothing after a face full of falafel :) I've yet to try to make it on my own, so I haven't hunted down a recipe, but I still feel a little virtuous for BUYING delicious vegan food! Anyway, thanks for the review too because I am always a skeptic but would like a book like this. If I don't win it, I'm buying it! I would like to enter the giveaway. I can't choose only one favorite vegan dish so I'm sharing two. A vegetarian who loves vegan. I am fortunate enough to live in the bay area where shojin ryori cuisine is available at the amazing Cha-Ya restaurant. I eat there whenever possible. my omnivorous friend told me it was the best lasagna she'd ever eaten. I just sub coconut milk in for the heavy cream, and omit the paneer. For protein, add chickpeas or kidney beans at the end. "the author, Mari Fujii, married to Buddhist monk" Buddhist monk in Japan can get married? o_O?? I think it's an interesting book. I'm truly carnivore, I can't eat vegan nor vegetarian food although I tried, Fails!! I don't know why but i feel lack of something or probably they just not tasty enough. [quote=diana]"the author, Mari Fujii, married to Buddhist monk" Buddhist monk in Japan can get married? o_O?? Depending on the kind of monk they are, they can get married. Just like Protestant church officials can get married (but not Catholics). I don't know how to link. But my favorite vegan recipe is warm lentil salad; lentils cooked with onions, celery, carrots and mushrooms. With a finishing squeeze of lemon juice. My favorite vegan dish is in fact one of your recipes: Vegan Turnip Cake or Daikon Radish Cake. Been a follower of your websites, and whipping up dishes using your recipes. My family loves your noodles recipe especially. My fave vegan recipe is probably this made with non-dairy fat rather than butter (I like throwing in a bit of sesame oil or other interesting oil to vary the tastes a little). It makes a good bento side dish for protein. We had a huge garden when I was growing up, and as soon as the squash (white UFO-shaped things) was ready, once a week, Dad would pick a couple nice ones and send us into the garden for orange tomatoes and he would slice them up and some onions and we would have a vege-fry. He would fry and fry and fry (and sometimes send us up to the garden again) and my brothers and I would eat and eat and eat! I finally found the seeds for those squash this year, and I have some growing in MY garden now too! I even bought a couple of tomato plants so MY boys can have a squash-tomato fry like I remember! (and I'll even remember to sprinkle some sugar on top of the frying tomatoes!) Yum!!!!!! i love making guacamole a lot but i also love cooking jpn foods! My favorite vegan recipe is a dish I don't really have a recipe for, since I made it up -- stir fry tofu, kale, sesame seeds, maybe some mushrooms and a bit of onion in a wok, and make a sauce by mixing red miso paste, water, sri racha hot sauce, and a little mirin (a touch of honey can be nice, too). Serve with rice, of course! My favourite recipe at the moment is a slight adaptation of Maki's Tori Nabe. I omit the chicken obviously, and use vegetable stock. And I add some wakame because I love it and it sort of makes up for not using the konbu. But I still call it Tori Nabe! ;-) I have a habit of using the original recipe name even after I have veganised a recipe. This book looks wonderful...being a vegan I'm always interested in learning new vegan cooking techniques, especially when they're related to an authentic part of a culture. There are so many really great vegan dishes to choose from, though one of my all time favorites is really simple: sticky white rice, toasted sesame seeds, tamari, and avocado sliced or cubed. It is my comfort food. I'm not a vegan, but I do love vegan food for healthy snacks. Edamame + a bit of water for a five minute spin in the microwave. That's it. Salt if you really want it. Maybe not quite a "dish" per se, but it's tasty. ...I'm always looking for great vegetable recipes! Interesting. I am having trouble finding new ways to cook vegetable at home. So I will definitely give it a try. I would love this book! It looks fantastic! Honestly, one of my favourite meals is just a gigantic salad. While I love 精進料理, especially Koya-dofu, I don't actually make a point of cooking explicitly vegan recipes myself--with the exception of Maki's Zucchini & Chickpea Pancakes. I'm usually rather skittish about trying recipes that I haven't tasted before, but I took a chance on this one and it's become one of my favorites! That books looks fun! Right now, I love salad. I am not sure what is going on but I can not get enough of it, just plain salad. At least it is easy!! I love pretty much all vegetables, especially simple edamame and rice. For rich and delicious mashed potatoes, add avocado. Just imagine, in a bite of already creamy potatoes, you teeth slipping thru a nibble of avocado...what a lovely texture and flavor contrast. My daughter and grandchildren recently visited and she rolled her eyes imagining the combination—but she and the kids cleaned up every last dab. Commercial potatoes are one of the four vegetables highest in pesticide residues; if at all possible buy organic potatoes. The other three most chemically contaminated vegetables are celery, spinach and sweet peppers. For more details see When Not to Buy Organic. You may peel the potatoes if you wish, but I prefer keeping them intact for the extra nutrients. Place the potatoes in a medium sized pot and add cold water to cover. Add salt and bring to a boil. Cook at a steady simmer until the potatoes are very tender and easily pierced with a fork, about 15-20 minutes. Drain the potatoes but reserve the liquid. Pass through a ricer or mash with a potato masher or fork. Fold in the avocado, oil, dill, pepper, lemon juice and adjust salt. If necessary, gently mix in 1 to 2 tablespoons reserved potato cooking water for desired consistency. Serve immediately. It has it all you need, it's delicious and very fresh due to the mango. And the cilantro really adds something to the excitement of this dish, haha! Sometimes I use black lentils instead of black beans, depending what I have at hand. Enjoy and no matter whether I win or not, TRY THIS!! My favourite vegan recipe varies, but I love the Ginger-Macadamia-Coconut Carrot Cake from Vegan with a Vengeance. It's really good, and I don't have a sweet tooth. Or for something savoury, an Asparagus Quiche with Tomato and Tarragon, from Veganomicon. Both books are by Isa Chandra Moskowitz. Hmm, your mention of aubergine reminded me of the Spicy Chilli Eggplant I made last week. The recipe came from a book called "The Asian Vegan Kitchen" by Hema Parekh, which I picked up at Maruzen near Tokyo station. Usually my adventures with eggplant turn out below average but this one was so good I made it two weeks in a row. I'm an Indian woman living in Basel and my very favorite vegan food item is a masala dosa with all its fixings The very best dosas are not served at home (hence no link to recipe) but at eateries. Sigh, I missed the giveaway. I love goma-tofu and am saving up my pennies to experience shojin ryori here in NYC (Kajitsu). I've been enjoying your sites for some time now and just discovered this review of the Enlightened Kitchen. Earlier in the week I atteneded one of the author's cooking classes and had a wonderful time - she is a lovely lady with a real knack for sharing her love of food. Anyhow, the only downside to the food was the amount of deep-frying involved... have you found this with the book as well? If so, can you suggest any alternatives? I'm interested to know before I buy the book online. Hi lizu, the book is in storage right now so I can't take a look at it, but if i recall there are a lot of not-fried recipes in there. Keep in mind that it's not a dieting book per se, and there is quite a lot of deep frying in Japanese cooking (you just don't eat a lot of it at one time). HTH!